The Tobin House is nostalgia at its best! 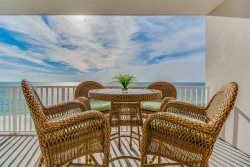 Located on Old River in the Perdido Key State Preserve, the Tobin House is perfect for special family gatherings. You'll have a private pier and covered gazebo--you've never seen such spectacular sunsets! Just one block's walk to the beach, and remember, there are no condos in the state park. Three bedrooms, three baths. This one's our best-kept secret!